More than 50,000 union workers went on a 3-day strike in May against University of California medical facilities across the state to fight for a fair contract. More than 50,000 workers, including thousands in Sacramento, went on a three-day strike in May to fight for a fair labor contract at University of California medical facilities across the state. Joe Trujillo told media. Trujillo is a senior cook at University of California, Davis Medical Center. The California Nurses Association and the University Professional and Technical Employees-CWA, both of which have also been locked in long contract negotiations with the university, joined AFSCME 3299 in the strike. “UC Davis Medical Center nurses support our fellow UC workers in their demands for a strong contract and justice in the workplace. As nurses we know that in order to provide the safe patient care our communities need we count on our co-workers and they count on us,” said UC Davis registered nurse Melissa Johnson-Camacho in a statement from CNA. As AFSCME-represented UC service workers concluded the three day strike, Lieutenant Governor Gavin Newsom and State Senator Kevin De Leon (D-Los Angeles) joined the chorus of state leaders urging UC President Janet Napolitano to return to the bargaining table to negotiate in good faith to address workers concerns, according to a statement from the union. “The wage disparities amongst racial, gender, and socio-economic lines recently highlighted by UC’s own employment data is startling,” wrote De Leon, who joined striking workers today on picket lines at UC Davis Medical Center. “I urge the University to return to negotiations with urgency, and in good faith,” wrote Newsom. 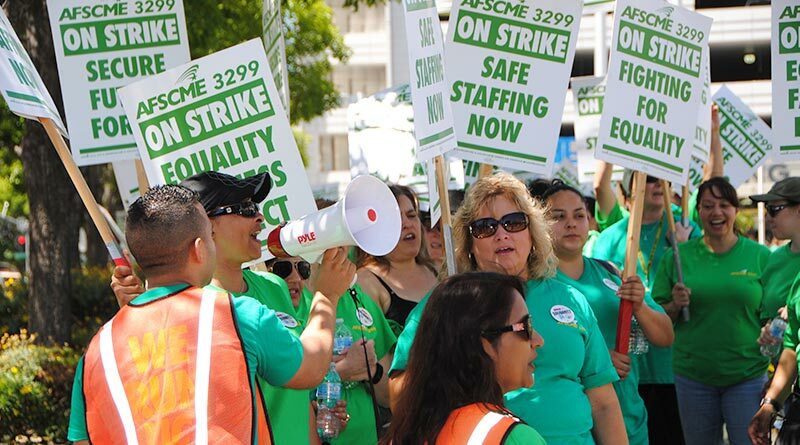 AFSCME 3299 negotiators have sought wage increases of 6 percent, a freeze on health-care premiums and elimination of contracting out jobs for which its members are trained. AFSCME 3299 rejected the university’s last-and-best offer of 3 percent across-the-board wage increases and a prorated, lump-sum payment of $750. While imposing employment terms on its lowest wage service employees, Napolitano and UC administrators have yet to acknowledge workers’ chief concern: the outsourcing of their jobs, which a recent report suggests drives income, racial, and gender inequality at UC. UC has suggested as many as 7,000 jobs have been outsourced to low wage contractors. As UC outsourcing has grown, research shows that African Americans are disappearing from UC’s directly-employed workforce, and are now more likely to work for low wage firms under contract with UC for a fraction of the wages and few, if any benefits. They also face higher risk of wage theft and other workplace abuses. In fact, UC’s own internal audits revealed that the University wasn’t enforcing its own contractor minimum wage, creating additional hardships for its most vulnerable workers. “Disparities will only widen with the University’s continued outsourcing of low-wage work,” Assembly Appropriations Committee Chair Lorena Gonzalez-Fletcher (D-San Diego) and 24 other state legislators wrote in a letter to UC President Napolitano, as reported by AFSCME. California State Auditor Elaine Howle has also confirmed that UC is displacing its own career workers through outsourcing while often violating its own competitive bidding rules in the process. No resolution on the contract has yet been reached with the University. 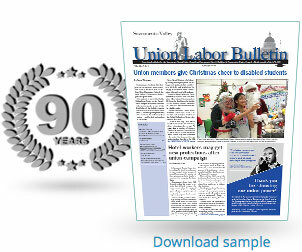 The American Federation of State, County and Municipal Employees, UC’s largest employee union, representing respiratory therapists, surgical technicians, custodians and groundskeepers. The California Nurses Association represents 14,000 members, and University Professional and Technical Employees-CWA has 15,000 members.